Come take a peek as over forty authors share their stories of sisterhood in essays, reflections, and poetry. On some you’ll laugh. On some you’ll cry. But on all, your heart will feel the warmth and love as you read the tales of sisters. This anthology about sisters actually began last year. Searching for a unique gift for my mother that was about to turn eighty – who didn’t need any more knick-knacks or afghans – I thought of writing a book about mothers to dedicate to her. Alas, I knew that I couldn’t write an entire book in the short time frame I was looking at. An anthology was born, and In Celebration of Mothers was published November 2016. Another new year rolled around, and what was on the agenda? Another anthology – this one about sisters. 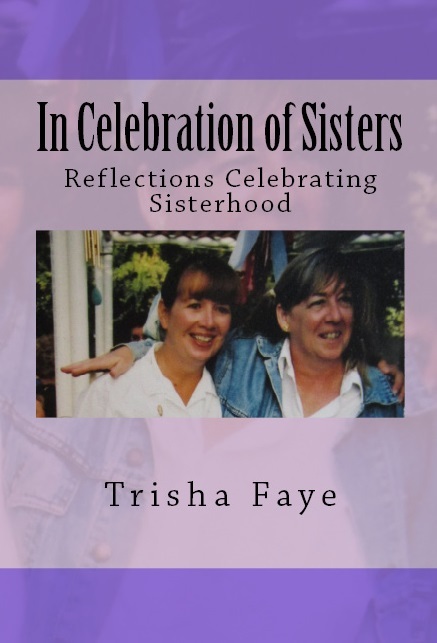 Over forty authors contributed essays, poems and reflections for In Celebration of Sisters. Several of them are returning authors from last year’s anthology. Do you know the best part of this whole process? It’s the new friends I’ve discovered on this writing and publishing pathway. My world is larger and richer because of these books. I hope their stories touch your heart and add richness to your life also. Trisha Faye writes from North Texas, usually with a cat on her lap. She adores writing about people and items from the past unless she gets a chance to write about her family, which wins out over all other subjects. You can find her at www.trishafaye.com or on Facebook https://www.facebook.com/trisha.faye.5.